Apollo 1 astronauts pose in front of Pad 34. 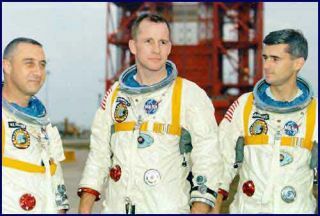 From left: Virgil I. Grissom, Edward H. White II, Roger B. Chaffee. NASA and the city ofTitusville will pay tribute this week to American astronauts who lost theirlives in the line of duty. With the anniversaries ofthe 1967 Apollo1 launch pad fire, the 1986 Challenger explosion and the 2003Columbia accident all in the next eight days, NASA will stage a Day ofRemembrance ceremony on Thursday at the Kennedy Space Center Visitor Complex. KSC Director Robert Cabana,a former astronaut, will lay a wreath at the base of the Space Mirror Memorialat 9:30 a.m. Thursday. "It honors all thosewho have died in the pursuit of space exploration and discovery," said KSCspokesman Allard Beutel. Cabana, who commanded twoshuttle missions and piloted two others, also will be the keynote speaker atthe city of Titusville's Astronaut Memorial Ceremony on Saturday. Mayor Jim Tully and Cabanawill speak at the ceremony, which is scheduled to take place from 10 a.m. to 11a.m. at Sand Point Park. Held annually, the ceremonypays tribute to the Apollo 1, Challenger and Columbia astronauts and honors"all astronauts who brave the unknown challenges of space," accordingto a public notice posted at the city's Web site. The Apollo 1 astronautsdied when a fire broke out in their spacecraft during a practice countdown. The Challenger astronautswere killed when theirshuttle exploded 73 seconds after lifting off from Kennedy Space Center'slaunch pad 39B. The crew included ChristaMcAuliffe, NASA's first "teacher-in-space." TheColumbia astronauts died when their spaceship broke apart over Texas duringan ill-fated atmospheric reentry. Also honored on the SpaceMirror Memorial are Theodore Freeman, Charles Bassett, Elliott See and CliftonWilliams, all of whom died in T-38 training jet accidents; Michael Adams, whodied in an X-15 accident; Robert Lawrence, who died in aF-104 accident; and Manley "Sonny" Carter, who died in a commercialairline crash. Publishedunder license from FLORIDA TODAY. Copyright ? 2009 FLORIDA TODAY.No portion of this material may be reproduced in any way without the writtenconsent of FLORIDA TODAY.